Julian Dyson - Doll - Original Painting. Julian Dyson 1936 - 2003. 1983 to work part time before fully retiring from dentistry in 1997. Even though he always found time to work as an artist, this was the first time he had to devote all his time to his art. Completely self taught, he believed he should have started his full time artistic career much earlier than he did. In the short time he pursued his art, he established for himself a reputation as an interesting painter and sculptor. He became a respected, well-liked artist ad was a personality who is fondly remembered by friends and fellow artists. He said of himself in 2001. "As a child I would despair at the coarseness and clumsiness of my painting and drawing. So many other children seemed to have a facility that eluded me. Now that I approach old age , I think that this has perhaps helped me. Drawing was persistence. A feeling of rhythm slowly developed. I find that a good day for drawing is as I imagine making music would be. Wind and rain decide the way I draw. Good drawing must always have the smell of the day. Through all this I have found that toughness and clumsiness can some times be beautiful. The flaws and exploratory marks in my work are an important part of the final image." 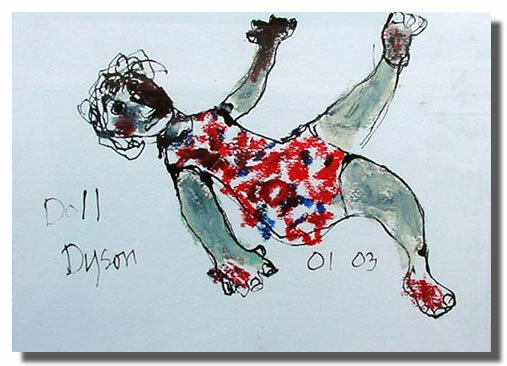 Original painting by Julian Dyson - The Doll.